Los Angeles’ Metro is doing something that no transit agency in the country has ever done: it’s marketing its products and services as if it were a private company bent on turning a profit. But for Metro marketing isn’t about increasing the bottom line. It’s about reducing traffic, cleaning the air and making people’s commutes in this auto-clogged city a bit less stressful. Making buses appear as an attractive alternative to cars is an ambitious goal for any transit agency, but it’s especially ambitious in a place like Los Angeles where image and the automobile are everything. Yet, traveling around LA it’s hard not to feel the presence of Metro. It’s fleet of colorful buses are ubiquitous on every major city street. And unlike standard city buses, these buses aren’t dreary and dull. They boast vibrant colors like California poppy from a color palette inspired by the city. 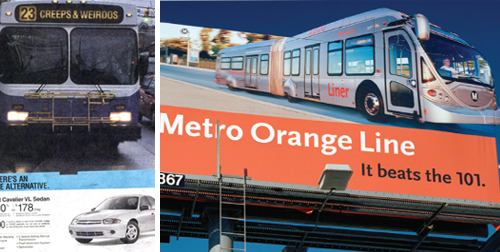 Metro also has a number of playful ads on billboards encouraging Angelinos to leave their cars at home and take the bus, rail or carpool. Comic Relief: One of a number of funny ads for transit. These ads and the re-brand of Metro seem to be paying off. Earlier this year the Creative Services division of Metro was instrumental in the success of Measure R, a 1/2 cent sales tax that is expected to generate 40 billion dollars over the next 30 years for improving transit services in LA. To get the 2/3 vote required, Metro convinced the vast majority of Angelinos, most of whom commute by private car, that they should pay for transit out of their own pockets. The most impressive outcome of Metro’s marketing is that it has convinced people to start using its services. Following Metro’s re-brand, discretionary riders, those people who have the choice to commute by car or transit, have jumped from 24 to 36 percent. That is, Metro’s new clean and modern image is actually getting people into transit and helping address this city’s notorious traffic problem. For people involved in advertising and marketing this really shouldn’t come as a surprise. The reason why the pharmaceutical industry, for example, spends over 33% of its revenue on marketing is because it works. Otherwise, why would they do it? It’s true for every other industry as well, including the automobile industry which spends roughly $21 billion to convince you and me that we cant live without cars. 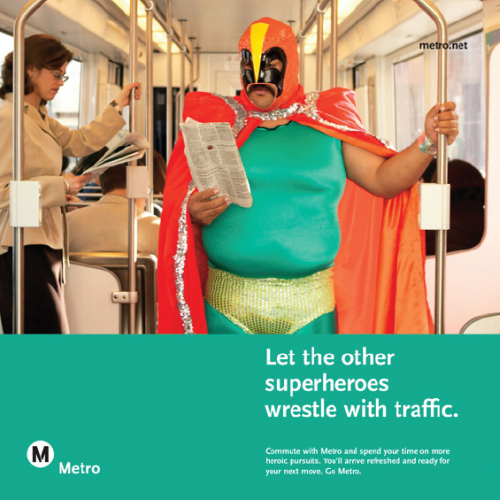 So why aren’t more transit agencies following LA’s lead and investing in marketing? Image Matters: Chevrolet’s portrayal of a city bus suggests that transit is something to be avoided – it’s full of creeps and weirdos. By contrast, LA Metro’s sleek depiction of the new orange line is intended to attract the sophisticated commuter. Targeting Trend Setters: For its opposites ad campaign, Metro gave out shirts to trend setters like these baristas from a local cafe. Photo courtesy of Metro. There’s no doubt that LA still has a long way to go to solve its traffic problems. The first day I arrived here was a Wednesday and at 10:30 PM I got snared in a traffic jam on the 101. As a friend who lives here told me, “Traffic just sort of pops up out of nowhere.” Fortunately, Metro is set on increasing transit ridership by doing a number of big projects like the orange line expansion, the now complete gold line expansion, and perhaps even the ambitious “subway to the sea.” And unlike other cities, LA will likely see a greater than normal increase in ridership thanks to its great marketing. What Are Best Practices in Transit Branding, Marketing and Communications?